Mary Doran from Newtowncunningham was watching Winning Streak last weekend and knew she had a scratch card sent into the show. She was alone in the house with just her grandson when her name was called out. However, by the time the show was coming to a close, the house was full of her family all keenly waiting for the full address to be shown at the end of the show. Mary’s husband Stephen and eight adult children, Vanessa, Marian, Elizabeth, Gillian, Amanda, Anne Marie, Sandra and Steve will be in the audience to cheer her on this Saturday, 27th April. 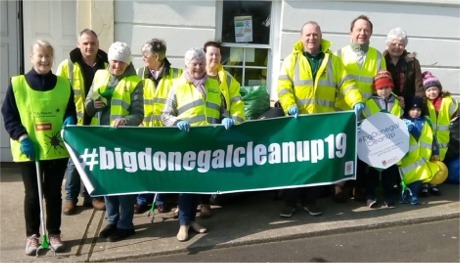 With the good weather forecasted over the next few days, the sun will be shining on Inishowen volunteers who will be out again as part of the Big Donegal Clean Up. Clean ups are planned for Ballyliffin, Clonmany and Carndonagh. • Ballyliffin Tidy Towns are having a big clean up on Friday, 19 April, starting at 11am and meeting at Pollen Beach Car Park. • Clonmany Tidy Towns are having a big clean up of Urris, Dunaff, Leenan and surrounding areas on Friday, 19 April and there are two meeting points; St. Marys Hall, Clonmany and Tiernasligo, Urris at 10am. Gardaí arrested three men, (31, 25 and 24 years of age) when they carried out a search of a house in Letterkenny on Tuesday, 16th April, 2019. The operation was part of an ongoing investigation into a Romanian organised crime group. A large amount of fraud paraphernalia including suspected cloned credit cards, credit cards issued in false names, bank account details, false Romanian identity documents, credit card machines, till rolls and a number of suspected stolen Irish and UK passports and driving licences along with two cars bought on finance obtained on bank accounts opened in false names were discovered at the location and seized. 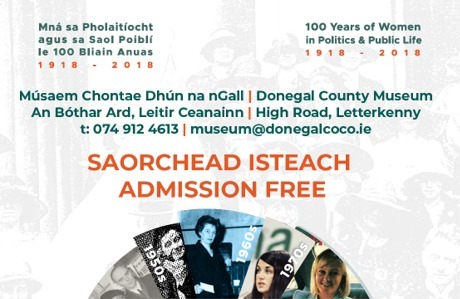 Donegal County Museum’s new temporary exhibition celebrates 100 years of women in politics and public life, by shining a spotlight on the stories of women who have contributed significantly to Irish political and public life over the past century and on the challenges they faced and the obstacles they overcame. The exhibition runs to the end of June at Donegal County Museum, High Road, Letterkenny. Opening hours 10am – 4.30pm (Lunch 12.30 – 1pm) and Saturday 1- 4.30pm. Admission is free. Tel: 074 9124613 or Email: museum@donegacoco.ie . Garda Campus Watch warns young students never allow your bank account to be used by someone else. The "Creating Fraud Awareness” campaign will run until Friday 31st May 2019. Students are often targeted by organised crime gangs to act as money mules, laundering thousands through their accounts in exchange for a few hundred euro. Niamh Davenport, Head of Fraud Prevention said: "We understand that young adults are trying to juggle work and study with an active social life, with all kinds of costs to cover and it can be very tempting when someone offers you the chance to earn extra cash quickly for little effort. We’re urging young people to be smart when it comes to money mule recruitment, whether it’s someone asking for a favour or promising payment. Know the warning signs, understand the risks and check with someone you really trust if you’re unsure." Don’t Fear The Natives are a six-piece alt-rock outfit from Buncrana. They are winning admirers with their blistering guitar rock, drawing on classic influences as diverse as The Beatles, Stone Roses and Nirvana. 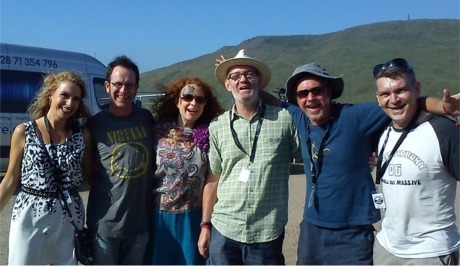 The band have been selected to play at this year's Vantastival festival in Co Louth, however they need your vote to help them on their journey to the Main Stage. To vote click here and you'll also be entered into a competition for a VIP Festival Weekend. The Irish Heart Foundation’s Mobile Health Unit is coming to Kernan's Eurospar in Newtowncunningham on Tuesday, 9th April, from 10am to 5pm. Nurses will be on hand to offer locals free blood pressure checks, heart health information and lifestyle advice. High blood pressure, the leading cause of stroke and heart attack, is a silent killer. Almost two thirds of people over 50 in Ireland have high blood pressure – that’s almost 800,000 people. The Irish Heart Foundation is urging people in Inishowen to avail of this quick and non-invasive free health check. The Motor Insurers’ Bureau of Ireland (MIBI) has advised all Inishowen motorists, expecting to drive in Northern Ireland or the rest of the UK in the days immediately after Brexit, they still have time to get their Green Cards. Policyholders from Inishowen who may be impacted and have not already received a Green Card are encouraged to contact their insurance providers to ensure they receive their documentation before Brexit. Green Cards are internationally recognised insurance documents which provide proof of insurance cover to law enforcement agencies. If there is a ‘no deal’ Brexit then any motorist who plans on driving their Irish registered vehicle in Northern Ireland or the UK is advised to ensure they have a Green Card or they could possibly be subjected to the penalties for driving uninsured. A new weekly support group for stroke survivors in Donegal will be launched by the Irish Heart Foundation and members of Letterkenny General Hospital stroke team at a public information evening in the Silver Tassie Hotel, Letterkenny on Wednesday 10th April. The aim of the group is to offer support, assistance, advice, physical therapies and a social outlet to stroke survivors and their carers. The group will meet weekly every Tuesday from 11am to 1pm in the Silver Tassie Hotel. The first meeting will take place on Tuesday 16th April. The group is free to join and attend and will be open to anyone who has had a stroke, or has been affected by the condition. To register for the event, please contact Tracy Egan in the Irish Heart Foundation by email at tegan@irisheart.ie or by calling 087 292 0956. Galway based artist and Artlink member Emma Zukovic is presenting a new body of work, Post Memory from a Lost Country, at Fort Dunree. Emma Zukovic’s practice is concerned with the disappearance of Yugoslavia, and those who struggled with cultural identity as a direct result. This concern extends to the diaspora displaced by the Yugoslav wars, of which her family counts themselves. Post Memory from a Lost Country is on from 30 March - 24 April, at the Saldhana Gallery, Fort Dunree. The exhibition preview is this Saturday, 30 March, from 2pm - 4pm. The Asthma Society is calling on people in Inishowen with children under 15 with asthma or those who care for someone with asthma to complete a survey which aims to find out more about how much asthma costs both the state and people with asthma. The research report will also explore how an annual asthma structured review could help save both people with asthma and the state money, while also providing asthma patients with better health outcomes. The survey can be found here . People who undertake the survey are encouraged to share the survey with their family and friends. 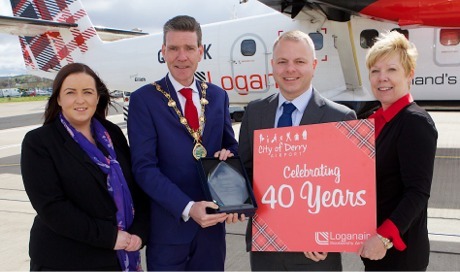 On completion of the survey, people will be entered into a draw to win a €100 One4all voucher.